Acquiring your first car is a big step in your financial life. Most likely, your first car is going to be a used model, but that doesn’t matter. What’s important is that you are able to pay for it, and that it can get you around town successfully from day to day. Of course, you don’t want to get in over your head from a financial perspective on this purchase. Overspending on your car could mean you have to get rid of it shortly after you pick it out. To avoid that outcome, check out these tips to help you budget for your first car. The first thing to consider is how money you can afford to spend on a monthly basis for your first car. Figure out how much money you make each month. Then add up how much of that money is already spoken for with other expenses. Of course, you want to be able to save some money at the end of the month as well, so don’t be tempted to push your budget right on up to the max. Once you have picked out a number that you are comfortable with for your monthly expenditure on this purchase, you can then move on to the next step in budgeting for your first car. 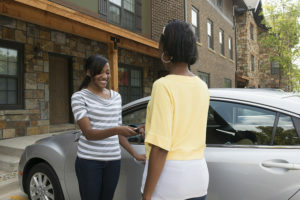 Making the payments on your first car will be the biggest part of your expense. But don’t forget about insurance as a part of the puzzle. The insurance premium that you need to pay each month is going to depend on a number of factors, including your driving history, the value of the vehicle, and more. Before you finalize the purchase of any car, make sure you research the cost of the insurance in order to get a clear picture of your total costs. You have two options when you are going to acquire a car for the first time. You can buy the car (new or used), or you can lease it. Each option has advantages and disadvantages, so you will want to think about which one makes the most sense in your case. Most leases have relatively tight mileage restrictions, so leasing might not be a good option if you tend to drive a lot of miles. Purchasing a car is usually seen as the better way to spend your money, but there are situations in which a lease makes more sense. One of the hidden expenses associated with owning a car is having routine maintenance performed on a periodic basis. You will need to change the oil from time to time based on the manufacturers recommendations. There will also be other costs such as tires, brakes, and more. While these aren’t going to be expenses that you will incur every month, they should be considered. They are going to be part of the overall cost of operating the vehicle. You don’t want your car to become a point of stress within your budget, so think about these maintenance costs while you are building out your budget for this exciting purchase. When did you get your first car? Can you think anything else that should be included in the budget for your first car? Best bet is to do what you said – figure out what you can afford monthly, but then save the money each month in the bank instead of buying right away… then pay cash for the car later. The average car payment is right around $500/month. That’s a huge drain on wealth-building. Save that for a year and pay cash for a $6k car IMO.